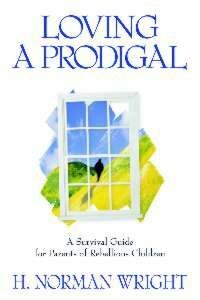 - Publisher Written for parents of a prodigal child, this book provides understanding, comfort, and guidance. Basing his advice on life experience, Norm Wright helps parents get past the hurt and family stress. Written for parents of a prodigal child, this book provides understanding, comfort, and guidance. Basing his advice on life experience, Norm Wright helps parents get past the hurt and family stress. Dr. H. Norman Wright is one of America's most prominent Christian counselors. He is a licensed Marriage, Family and Child Therapist. Dr. Wright is a graduate of Westmont College, Fuller Theological Seminary (M.R.E. ), Pepperdine University (M.A.). He has written numerous best-selling books on Communication, Family and Parenting. His titles include Communication: Key to Your Marriage; Always Daddy's Girl; Quiet Times for Couples; The Power of a Parent's Words and the Premarital Counseling Handbook. Dr. Wright is currently on the faculty of the Talbot School of Theology and was the former director of their Graduate Department of Marriage, Family and Child Counseling.